Is something like this possible with the physical ocean from the community project or Waveworks? Basically changing sea states gradually at runtime without sudden changes in sea state? I've been playing with the CashGenUE4 plugin and its great for seafloors! If anyone needs any help let me know. Yes, you just need to change the values of the wave clusters at the moment. Its not going to look super realistic yet. But it works. [MENTION=5439]DotCam[/MENTION] if you ever did want to team up to code with trusted people that dont want to share all their secrets and visa-versa BitBucket is what I use. Private repos for free and I think it supports pulls from GitHub IIRC and works exactly like git, might be another implementation of git itself infact. Last edited by Nsomnia; 06-09-2016, 11:56 AM. Of course it's possible, and really simple to do. All you would need for that to work is bind the key events to increase/decrease a scalar 0-1 (or higher if you want) value, then multiply the Amplitude value by that scalar. I'm in the processing of going back to the old struct system for a 'secondary' buoyancy component a "buoyancy tank" that works off weight, and percent of tank filled with water vs air if anyone needs it let me know. How about more than just changing the amplitude value gradually? Is it possible to change the wave composition/phases gradually to change the actually final waveform gradually? Like going from small fast ripple waves to large rolling waves gradually without disturbing the physics objects. ¿It's necessary to have substance plugin? So I have got a project where I have migrated the ocean project into it and it kinda works but I don't have any of the underwater effects and I don't have the shoreline effect you have on the demo levels. Is there a quick and easy answer why? I have placed the ocean BP and the underwater BP in the level. EDIT: After digging around a little it seems I need a file which mimicks the landscape data so it knows where to process the shoreline, right? like a heightmap file or something? Also, I've noticed the 4.12.2 UE4 is out, when can we expect the update from your end or will the 4.12 stuff just work fine with the 4.12.2 engine? Last edited by dazuk1978; 06-10-2016, 08:20 AM. Erm, is that the picture you meant to include? The edge bleeding you see is from SSR, which has limited usefulness on an ocean. I turn it off, the artifacts are too visible. It's hard to tell the scale from that image, how close is the camera to the shore? 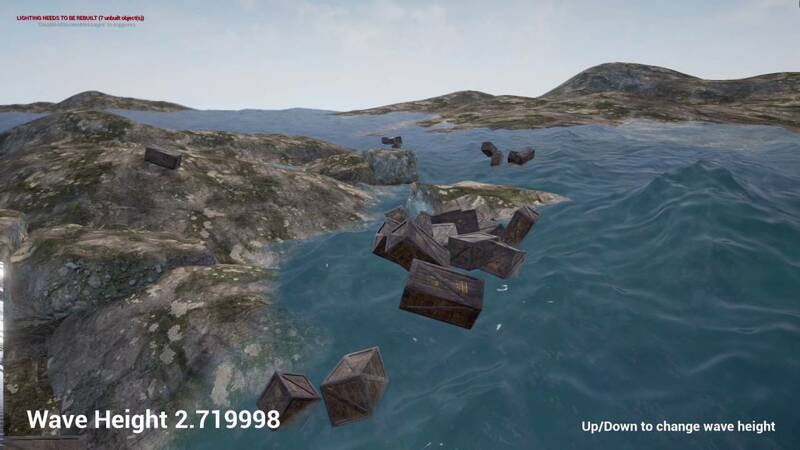 EDIT: For the shoreline effect you will need to add your landscape heightmap as a texture in the BP_Ocean details panel, this will modulate the waves based on your landscape. Is that what you mean? or do you mean shore foam? That means it is compiling shaders, which can take 5-15 minutes depending on your system. This is normal, just need to let it finish. I'm downloading the update right now, will push the changes to GitHub within the next couple hours. Last edited by DotCam; 06-10-2016, 09:30 AM. DotCam what part of the coast makes you such a nice person Surely you must get the daily PMs asking how to install etc. too?